TALON shallow water anchor, 12', Blue, Mfg# 1810451, control from wireless remote (2ea. Inc.), footswitch, Smartphone, or Hummingbird unit. Work light, multiple modes, wave Absorption, depth indicator, deploy alarm. 5 year/lifetime spike warranty. Minn Kota Talon BT 12 Feet Shallow Water Anchor - Blue Shallow Water Anchor 1810451. 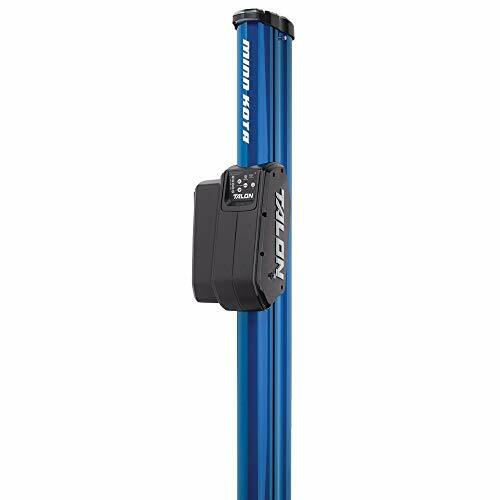 Minn Kota Talon BT 12' Shallow Water Anchor - Blue Includes Five Year Warranty The Minn Kota Talon Shallow Water Anchor can be easily deployed by tapping a button on your wireless remote to avoid the disturbance of holding it down and waiting. This talon holds steady even in currents and highwinds. It delivers strongest possible hold with Auto-Drive mode, which automatically powers the spike into the bottom with three successive hits using increasing force on each hit. The Talon Shallow Water Anchor features Built-In Wave Absorption allows your boat to move up or down without affecting the anchor. It's exclusive built-in floating suspension keeps you locked to the bottom, even in rough water. The lightweight design makes it easy to install as like a trolling motor, with no messy, complicated hydraulic pumps and hoses. Minn Kota Talon Shallow Water Anchor Features: Product # 1810451 Talon Shallow Water Anchor Electro-Mechanical Design Fast Deploy - Spike Deploys Faster For Getting In Position Quickly Auto Up/Down - Deploy Talon w/ Button On wireless Remote or Control Panel User Selectable Anchoring Modes - Adapts Easily To Changing Conditions Rough Water Mode Built-in Wave Absorption Quiet Running, Wont Spook Fish Simple & Innovative Design Triple Debris Sheild Protection Saltwater Tested - Saltwater Tough Versatile Adjustments 2 Standard Wireless Remotes LED Depth Indicator Deployment Notification Alarm 2X Anchoring Force Control Ancor Through Mobile App While we aim to supply accurate product information, it is sourced by manufacturers, suppliers and marketplace sellers, and has not been provided by Overstock. Last updated: April 20, 2019 at 11:24 EST. Pricing information is provided by the listed merchants. GoSale.com is not responsible for the accuracy of pricing information, product information or the images provided. Product prices and availability is subject to change. Any price and availability information displayed on amazon.com or other merchants at the time of purchase will apply to the purchase of the product. As always, be sure to visit the merchant's site to review and verify product information, price, and shipping costs. GoSale.com is not responsible for the content and opinions contained in customer submitted reviews.